As reported in Textile Conservation News, Fall 1990, by Julia Fenn, a conservator from the Royal Ontario Museum, phosphine is sometimes used for the fumigation of artifacts in museums. Fenn discusses in detail the effects of phosphine on various materials and textiles. Phosphine was originally used as a fumigant for grain and tobacco, and most research focuses on this use. Phostoxin is the brand name of a fumigant made by Degesch America Inc., and contains 55% ammonium phosphide, and 41% ammonium carbamate impregnated with paraffin. The ammonium phosphide reacts with water vapor in air to produce phosphine gas. Phosphine is not effective against fungi, bacteria, or pathogens. While it is not clear how the chemical works, it is theorized that it reacts with metal-containing enzymes in the presence of oxygen, or that it reduces bonds in insect protein. Adult insects and larvae are more receptive to the toxic effect of phosphine than are eggs, pupae, or dormant insects. Exposure time for textile pests has not been determined. Plastic wrapping or bags impede diffusion of the chemical. Phosphine can be absorbed through the skin, or via inhalation. Acute exposure to phosphine can produce lung irritation and burns that may take several days to be noticed. There can be a build-up of lung fluid that can be fatal. Acute effects include dizziness, lightheadedness, headache, anxiety, nausea, and vomiting. High levels can cause liver damage, convulsions, coma, and death. The health effects of chronic exposure to phosphine have not been thoroughly researched. Phosphine is flammable, and decomposition results in the release of toxic phosphorous oxides as well as phosphonic acid mist. 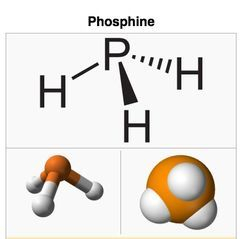 Because of phosphine's high reactivity, it must be stored separately from oxidizers, strong acids, halogenated hydrocarbons, oxygen, and away from air, moisture, heat, sparks, or flames. The American Conference of Governmental Industrial Hygienists (ACGIH) set the eight-hour time-weighted threshold limit value (TLV) at 0.3 ppm (parts of contaminant per million parts of air). There is a short-term exposure limit (STEL) of 1 ppm. The Occupational Safety and Health Administration (OSHA) sets a permissible exposure limit (PEL) of 0.3 ppm. It is necessary to make sure that the testing equipment is capable of measuring these low levels of phosphine. Because of the known acute hazards of exposure to phosphine, and the lack of adequate research on both chronic hazards and the effects of textile fumigation with phosphine, alternate methods of fumigation are suggested.